The following has kindly been translated for Children’s Rights Council of Japan by a U.S. licensed attorney who is a native speaker of Japanese. It is a translation of the Japanese Central Authority’s Application for Visitation Procedures section and is for those parents who are residing in the United States seeking Visitation Rights for Children located in Japan. separation of the child, the Applicant was prevented from visiting or meeting the child. accordingly to the laws of the original habitual residential country. As shown above, an Applicant may submit an Application to the Japanese Central Authority. If the Applicant is submitting an application to Japanese Central requesting Support in Visitation or Other Contacts with the Child, Applicant must fill in and submit the Designated Application Form along with the Necessary Documents. ※	LBPs who are seeking Visitation Rights through Japanese Courts may also directly Petition to the Tokyo/Osaka Family Courts. For more information on how to petition, please directly contact a Japanese Attorney or the Tokyo/Osaka Family Courts (in the original document it advises the Applicant to contact any Japanese Family Court. However, under the page for “Request for Assistance in Return of a Child,” it only designates the Tokyo/Osaka Family Courts as a contact.) However, please note that the Japanese Family Courts only accept communications in Japanese. In cases where the child’s caretaker is residing is unknown, the Central Authority, through assistance of the Japanese Administrative Agencies and/or the Local Public Agencies shall investigate the child and the caretaker’s whereabouts. 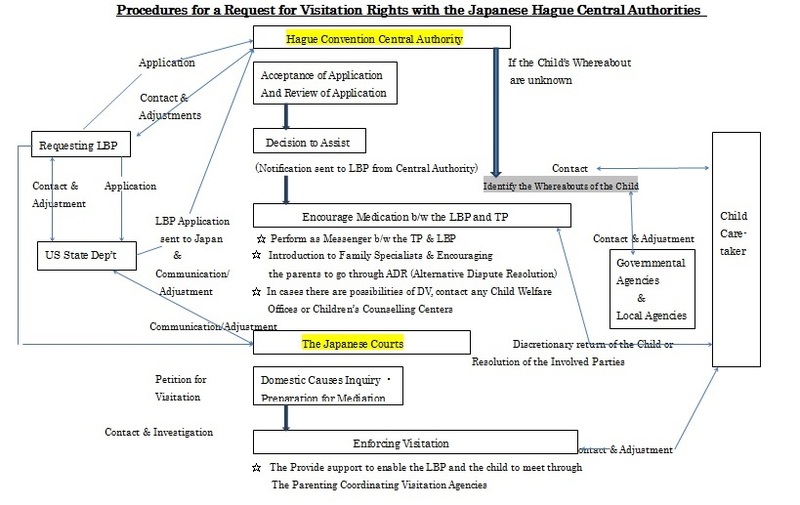 After reviewing the Application under the terms of the “Act for Implementation of the Convention on the Civil Aspects of International Child Abduction (http://www.japaneselawtranslation.go.jp/law/detail_main?re=02&vm=04&id=2159), the Central Authority shall make a decision on whether or not to Assist the Applicant through either one of the following actions and notify the Applicant of the action. (iii)	If the child is found to be residing in another Hague Member Country, the Central Authority shall forward the Copies of the Application along with the Accompanying Documents to that Country. Agencies or Legal Professionals Referral Programs. Applicants who are requesting Visitation with a child residing in Japan through the Central Authority may separately Petition to the Japanese Family Courts for (Domestic) Litigation or Mediation. Procedures for Visitation through the Japanese Family Courts basically shall be based on Domestic Laws of the Japanese Family Courts under normal procedures, unless the issue is to be handled specially for Jurisdictional Issues or Access to Court Records. (I shall be able to translate this section soon). By referring the involved parties to Parenting Coordinating Visitation Agencies in Japan, the Japanese Central Authority shall assist the involved parties with the (visitation) Orders decided upon Amicable Negotiations, Settlements, Mediation and Litigation. Learn more about this heartbreaking issue, and how to date no child has been returned to his/her country of habitual residence as a result of any action taken by the government of Japan. The Foreign Nurses Association of Japan presents the film as a public service. Q&A session with director David Hearn will follow the film. This event is open to the public–please invite friends and colleagues. For more information, please contact Ann Endo, endofam@gol.com. Reservations appreciated for planning purposes, but not required.